I just finished If a Tree Falls at Lunch Period, and I’m not sure yet how I feel about it. Kirsten is white, affluent, and overweight. Her parents fight constantly, she has terrible self esteem, and she eats to feel better. Walk is black, poor, and brilliant. He is told his father died in the Air Force, and his mom works hard to give him better opportunities in life. The book follows them as they enter 7th grade at an expensive private school outside San Francisco. He’s on scholarship, her family can afford the tuition. They become friends and discover some very explosive family secrets. They also deal with the trials of middle school, including a very powerful and very unfriendly Queen Bee figure in their class. The chapters alternate between Kirsten and Walk’s point of view, but only Kirsten’s chapters are in 1st person. I wish Walk’s were, too. I thought the ending was weak. Choldenko takes us to some revelations about Kirsten and Walk, but she doesn’t deal much with what happens afterwards. The book kind of just…ends. I didn’t get a strong sense that Kirsten’s self esteem would improve; her personal issues are summed up in one throwaway sentence where she decides that she matters. Her parents’ issues are also summed up in a sort of throwaway statement. The middle school drama is dead on, but I didn’t find the family dramas as believable. Walk’s feelings and perspective are the most realistic, but his story is told in 3rd person so we miss a great opportunity to get to know him better. The plot seemed very tidy, more of a device to discuss race and class issues than a fully fleshed out story. Despite my feelings about the drama in this book, it is incredibly funny. Their middle school world rings true, the dialog is great. I think middle schoolers will find the story compelling, but I think they’d want a meatier ending, too. It’s a good book. 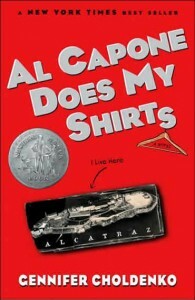 For a great Gennifer Choldenko book, I’d read Al Capone Does My Shirts. That is a terrific story about another 12-year-old living on Alcatraz in the 1930s. His father is a guard, his older sister is autistic in a time period when there was no word for it, and the warden’s daughter tries to enlist him in endless schemes that get him and his family in trouble. Choldenko is a funny writer, and she has this age group’s voice down perfectly. I didn’t expect to like this book, but I actually loved it. It was also a 2005 Newbery Honor Book. The Battle of the Labyrinth Is Here!